Our customers love this dessert box! It’s perfect for business meetings and events, or when you need to send a gift of food. 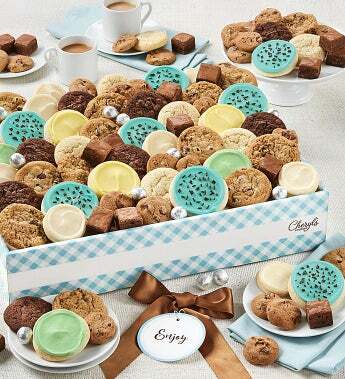 We’ve included a delicious assortment of Cheryl’s snack size cookies and brownies, assorted buttercream frosted cookies, signature brownies, crunchy chocolate chip cookies and foil wrapped milk chocolates.